Martin studied law but after his articles, left to become a reporter on the Pretoria News and then head of the Sunday Times’s Pretoria bureau where he reported extensively on the assassination of SA’s former representative at the International Monetary Fund and on the so-called Information Scandal – that era’s equivalent of the Arms Deal, then Parliamentary Correspondent for the Sunday Express (where he was responsible for the resignation of three cabinet ministers), and finally, head of Investigations at Rapport (where he exposed the so-called “kubus” pyramid scheme, probably the biggest consumer fraud of the century). He spent a year in London with the London Sunday Times’s world famous “Insight” team, and got to know all about the Italian/Sicilian mafia and how it operates worldwide, including in South Africa, then for three years, spent short stints on the Los Angeles Times on the trail of America’s biggest ever postal fraud – the foreign offshoot of SA’s Kubus scheme. In 1983, while at the Sunday Express, a colleague and he started Nose modelled on the British magazine, Private Eye, but since they could not be the Eye, they became the Nose that sniffed out the news you weren’t supposed to be told. Subscribers to Nose became members of The Paper Club about 900 including Harry Oppenheimer and various newspaper editors. They managed to publish 10 issues, by which time he was on trial in the Pretoria Regional Court for allegedly having criminally libeled the much-feared Minister of Law & Order, Louis le Grange. He was eventually found not guilty, after the Pretoria Receiver of Revenue bravely stepped forward to testify in his defense, confirming that the minister and his business partner were under investigation for operating a tax evasion scheme. But the case effectively bankrupted him. 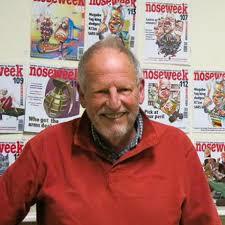 He returned to Cape Town to work as a freelance journalist and copywriter and started Noseweek in 1993 with R60 000 capital provided by friends. He has won the Checkers Award for Consumer Journalism, Stellenbosch Farmers’ Winery Award for enterprising journalism, the Pringle award for promoting press freedom, Mondi Premier Award for Business Journalism and the Sanlam Award for services to journalism.